Beat allergy season for good! As a parent, you should encourage your child to engage in free play outside with their friends. If you live in Central Texas, your child may suffer from allergies. 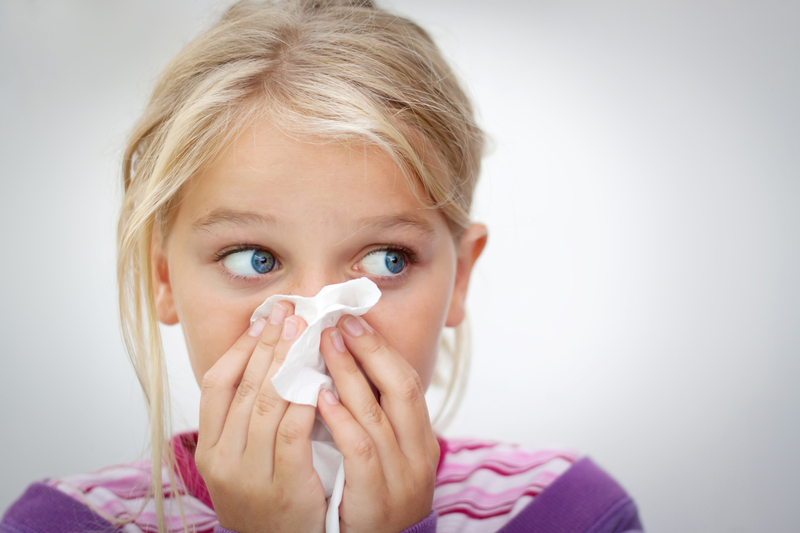 Allergies should be taken seriously, 70-80% of school-aged children also have allergies. in the Austin area, there is no relief from allergies. In other parts of the country, winter provides relief from allergies but in Austin the Mountain Cedar pollinates during this time. Next, you should see a doctor to confirm your suspicion. Your doctor will perform one of the following tests. Your doctor will also elevate family history and perform a medical evaluation. An allergy specialist can inject a small amount of allergy triggers into the skin using a needle. If your child is sensitive to a particular allergen, a raised bump will appear called a “wheal”. The wheal will be bigger depending on how sensitive your child is to a substance. This type of test may not be appropriate for young children scared of needles. Your pediatrician can administer a RAST test (radioallergosorbent test) which use radioactive or enzyme markers to detect antibodies. The RAST test is ideal for children scared of needles or children who have the potential for a severe reaction to allergens. After testing, your doctor will prescribe a treatment plan that may include medication. You can still allow your child to be a kid and control their allergy symptoms. Children with pet allergies shouldn’t have a pet in the home but that is often not possible due to the attachment of the pet to the family. Keep the pet out of the child’s room and make sure to bathe the pet frequently. Vacuuming pet hair frequently is also a must. Children who suffer from Cedar Fever, Hay Fever, or other pollen allergies should not play outside when the pollen count is high. The pollen count for the Austin area is tracked from Georgetown. Parents should sign up for an email alert so they will always know when the pollen count is dangerously high. At those times, the windows should be closed and the air conditioner turned on in the home. When the pollen count is high, your child should avoid the outdoors. How can you encourage your child to get fit when playing outside isn’t possible? You can still find fun activities to do inside that will get your child moving. Invite your child’s friends over for a fun game of Twister or take the kids bowling. Get creative and don’t be afraid to try something new! 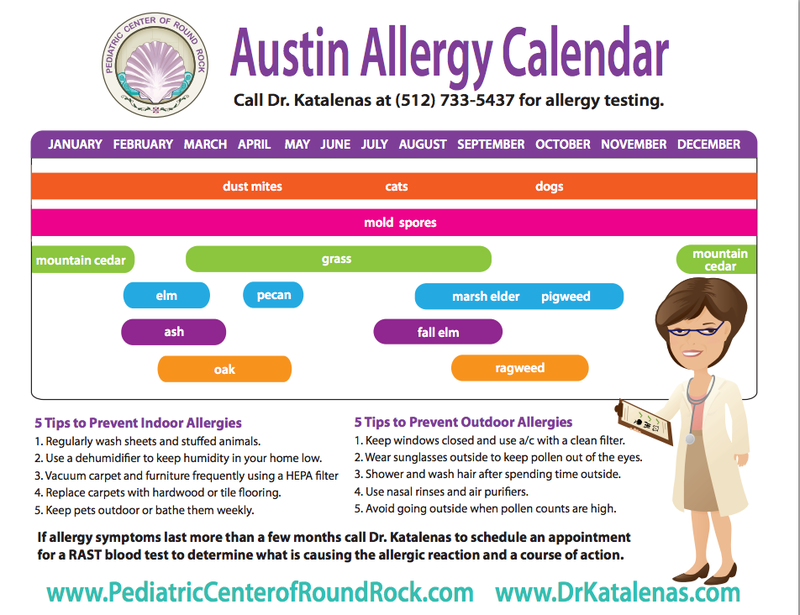 We’ve created a chart for the Austin area that you can print and post in your home to help you learn when to expect allergies and some tips to help you control allergy reactions in your child. If you determine that your child is having consistent and long-term allergy reactions, please call us at (512) 733-5437 to schedule an evaluation.